Personalized Dolphin Shape Address Sign - - large silhouette dolphin shape address plaque is approximately 23"W x 16-7/8"H. Made in the USA. Fast turnaround; ships in 3-4 days. Wall mount address sign custom made with your address and color choice. Line 1 holds five 3" characters. Line 2 holds twelve 1" characters. If ordering just a 1 line sign with a number, the character size and position will be adjusted accordingly. Made from sturdy and UV-stabilized non rusting laminated acrylic with engraved personalization. Characters are permanently engraved into the silhouette during the production process not painted or printed on. Note: style number shown in the sample is not printed on your dolphin. Dimensions: 23"W x 16-7/8"H x 1/8" thick. 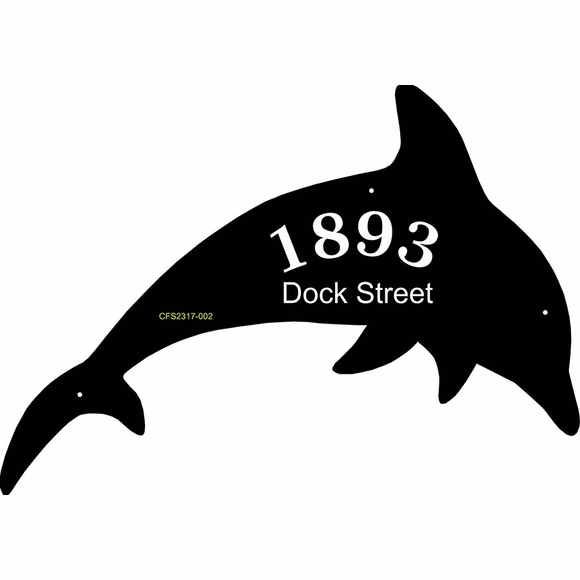 Other dolphin silhouette sizes available: can scale smaller or larger up to 36" wide. Please contact us with your requirements using the request a custom quote link at top of this page. Laminated acrylic silhouette address plaque crafted in the USA by skilled artisans to assure the highest quality.